Mario Chang of Guatemala and Rachel Willis-Sørensen of the United States won the top prizes at Operalia last night at the Dorothy Chandler Pavilion. Photo by Craig Mathew/LA Opera. 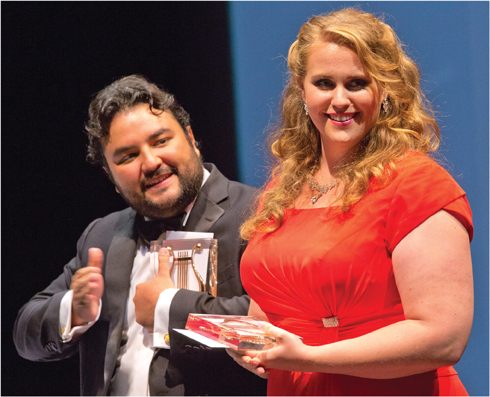 American soprano Rachel Willis-Sørensen and Guatemalan tenor Mario Chang each won the two top prizes in the 22nd annual Operalia, the world opera competition founded by Plácido Domingo that concluded last night at the Dorothy Chandler Pavilion. Søorensen and Chang won the male and female overall first prizes of $30,000 and the top Zarzuela prizes of $10,000 each. This marked just the third time since Operalia began a Zarzuela competition in 1995 that the same two singers won both portions of the contest; the others were in 2008 in Quebec and 2011 in Moscow. Sørensen, 30, who is an alumna of the Houston Grand Opera Studio and Santa Fe Opera Apprentice Program, also took home the Birgit Nilsson Price for Wagner/Strauss singing for her rich, soaring performance of Dich, teure Halle, from Wagner’s Tannhäuser Saturday night. That prize was a forgone conclusion since she was the only singer to choose an aria from those composers. Second prizes of $20,000 each went to American soprano Amanda Woodbury and Mexican-American tenor Joshua Guerrero. Third prizes of $10,000 each were awarded to sopranos Anaïs Constans, 26, of France and Mariangela Sicillia, 28, of Italy and counternors John Holiday, 29, of the U.S. and and Andrey Nemzer, 31, of Russia after scores from the 15 judges were tied for third place. Chang, 28, who recently completed his third year in the Metropolitan Opera’s Lindemann Young Artist Development Program, also won the male audience prize, while Woodbury was the voted the female audience favorite. Each won a watch from Rolex, the competition sponsor. Guerrero, a member of Los Angeles Opera’s Domingo-Colburn-Stein Young Artist Program, also captured the CulturArte Prize of $10,000. Chang became just the fourth singer to win the top two prizes plus the audience prize. In addition to her Tannhaüser aria, Søorensen — a statuesque blond wearing a bright red gown who had to overcome what is often a liability of being chosen as the first singer in the final round — was equally opulent in her Zarzuela aria, Tres horas antes del dia from Frederico Moreno Torroba’s La Marchenera. Chang’s gripping rendition of Ella mi fu rapita! from Verdi’s Rigoletto elicited one of the biggest audience ovations of the evening and he backed it up with a heartfelt offering of No puede ser from Pablo Sorozábal’s La tabemera del puerto in the Zarzuela portion. The 13 finalists came from 40 singers, ages 18-32, who represented 17 nations. The field was trimmed to 22 semifinalists earlier last week and then to 13 finalists for the concluding round. Five singers sang in the Zarzuela portion. This was the first year that no bass or baritone singer made the finals. Domingo, who in addition to being Operalia’s founder is LA Opera’s general director, conducted the LA Opera Orchestra for the final round and presented the prizes at the conclusion of the evening. Each of the singers sang in front of a backdrop representing their chosen opera. In addition to the audience in the Pavilion, the competition was streamed live via medici.tv. This year marked the third time that Operalia has been held in Los Angeles (the others were 2000 and 2004). The competition also was held in 2001 in Washington D.C. and 1999 in San Juan, Puerto Rico. • Unlike major instrumental competitions, which require quite extensive repertoire of contestants, Operalia singers were required only to prepare four arias in their original language, plus two Zarzuela pieces if they desired. Thus it was disappointing that all but one of the arias sung in the finals were from the 19th century (the exception was a Handel aria, which of course, was from the 18th). Nothing was selected from the 20th or 21st centuries. • Except for countertenor Andrey Nemzer singing an aria from Glinka’s Ruslan and Lyudmila and soprano Rachael Willis Sørenson’s number from Wagner’s Tannhauser, everything else was in French or Italian. • Following the competition, all 40 singers joined Domingo and the orchestra in singing the Operalia Hymn, which was composed by Plácido Domingo, Jr. Although none of the songs had supertranslations, one might have expected that the hymn lyric translations would have been projected. • The names and numbers for the first two singers weren’t projected (and since the house lights were down you couldn’t read the program). By the third singer the issue had been rectified. • Thank goodness for women! While men were in black tie or white tie (not a single red bow tie in evidence), the women offered a pleasing array of gowns, different in style and color. • Operalia took place at the same time as the first night of “Made in America,” the rock concert in nearby Grand Park. Fortunately, nothing — not even the heavily reverberant bass amps on the Grand Park stage — was evident in the Pavilion.